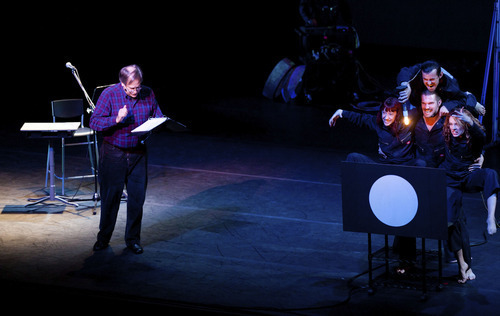 There was an early hint that "RadioLab Live: In the Dark" wasn't going to be your typical theatrical experience: Instead of being handed a program, audience members received a tiny plastic bag containing a hearing-aid battery and an LED lightbulb. Martin, a comedian known for his droll slideshow-assisted humor, warmed up the crowd and introduced Abumrad and Krulwich, co-hosts of "RadioLab"  a unique and insanely popular (judging by the two nearly-full Capitol Theatre performances Wednesday and Thursday) public-radio show that explores big questions using science, storytelling and sound. 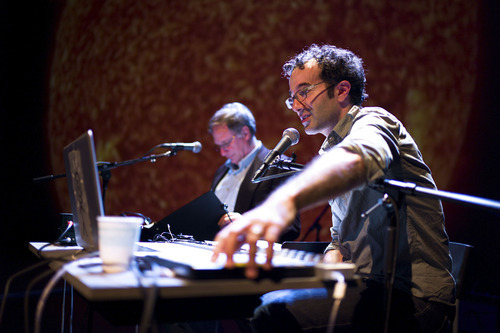 The nerdy Abumrad and the avuncular Krulwich  who have the appearance of a computer geek and his dorky dad  added a fascinating fourth element to their live production Thursday: Sight. The hosts took up the theme of darkness with three intriguing story segments. In the first, Abumrad explains to Krulwich (in the semi-improvisational banter that is the radio show's trademark) the evolution of the eye  how a mutated molecule sensitive to photons developed over billions of years to a fully functional image-sensitive retina. Aiding this explanation were six members of the modern dance troupe Pilobolus. Clad in blue industrial jumpsuits, the dancers functioned both as performers and roadies, moving lights and fixtures around the stage  such as the screen onto which they projected silhouettes, or the yard-wide eyeball they assembled piece-by-piece along with Abumrad's narrative. But it was the third segment  a fascinating interview with a NASA astronaut describing a harrowing spacewalk aboard the Russian MIR space station  that brought it all together to wonderful effect. Abumrad, mixing sounds like a club DJ, bounced from his narration to the astronaut's recorded snippets, blending in the live musical accompaniment of Thao Nguyen and her band. 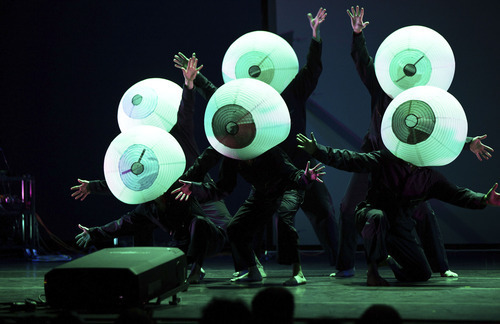 The Pilobolus dancers added compelling visuals, morphing their bodies to suggest weightlessness and to create silhouettes of a spacewalking astronaut. And, in a quietly beautiful finale, the dancers walked toward the edge of the stage with small LED lights, cueing the audience to unveil the "surprise." The audience members held their LED wires to their batteries, and soon a thousand-plus tiny lights turned the Capitol Theatre into an array of stars  a breathtaking coda to a night that was illuminating in all the best possible ways.